hmmmmm... wonder if I can make something with that? It's difficult to see in the picture, but the cherries on top of the two cupcakes are actually nail polish... so shiny! 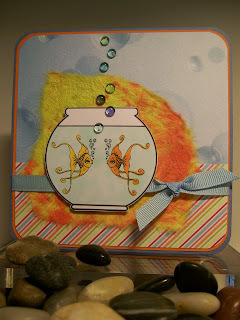 The designer paper directly behind the image is created with the two shades of nailpolish brushed lightly in a streaking motion onto yellow cardstock. I really wish I'd taken a picture of "my" designer paper before adhering it to the card, so you could get the whole effect. It turned out quite nice, but the cute CUTE image covers most of it up. In case you're wondering, the adorable image is a Bugaboo digital image! Precious!!! And Bugaboo is having a 50% off sale on ALL of their adorable images right now... so hurry on over and do some serious shopping. 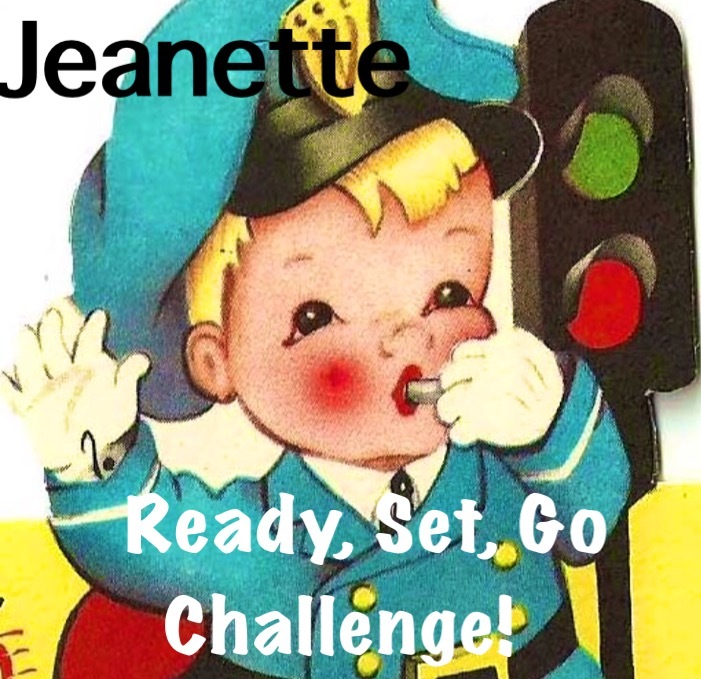 (Tell them Jeanette sent you.) The last day to purchase at 50% off is July 4. It's true! I wear flip flops as soon as the weather gets warm enough to do so. In the summertime, I rarely wear shoes except to go to church. 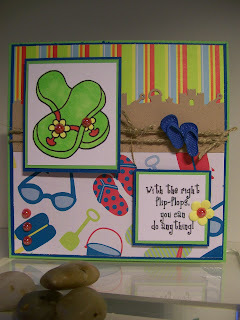 I ♥ Flip Flops! 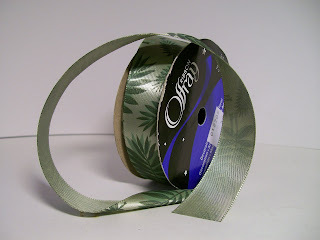 So I was super excited to see the freebie at Crafting with Dee Dee's. Check it out... you're going to want a pair for yourself. 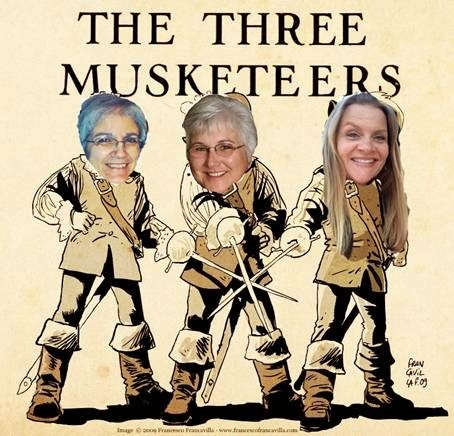 Thank you, Dee Dee, for this awesome image and a chance to play! 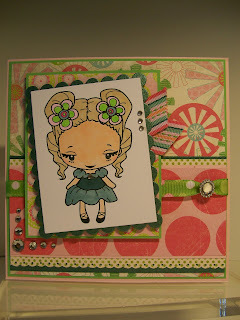 I ♥ Crafting with Dee Dee's Challenge, too! This week's challenge is for everyone to use the same image. Go to the Squigglefly Challenge blog for all the details. I used a paper piecing technique for the image and like the way it turned out. 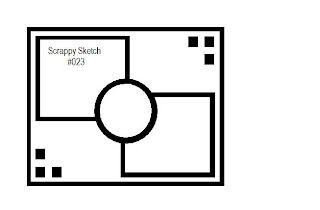 The layout is simple, which I think is very suitable for this modern image. This is my last creation as a Squigglefly design team member. It am both honored and humbled to have had this opportunity. Thank you to Holly, my team coordinator Maria, and all of my fellow team members. You are all an inspiration to me!!! I have enjoyed being part of the Squigglefly design team! 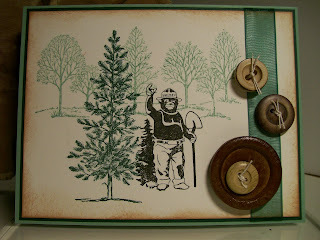 Please Note: I have two blog posts today, this one and the Crafty Ho's Challenge post that follows it. Please check them both out! Normally the KitCats post on the first Sunday of the month, but the past two months have been kind of crazy... and we've gotten off-schedule. In fact, so much so that we've decided to take a break for the rest of the summer. Therefore this is the last KitCat creation you'll be seeing on my blog at least until fall. I used almost every item Catherine sent. The only thing left untouched besides the other image was one piece of ribbon. (Well, actually, I did touch it. 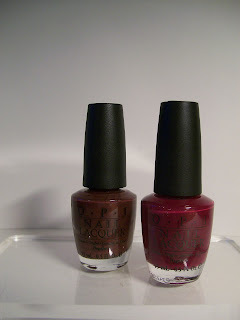 It is so pretty, I had to keep admiring it... but in the end, I didn't use it on my card.) The only thing I added to my card that Catherine didn't include in the kit was some Kaiser rhinestones and the plain cardstock. 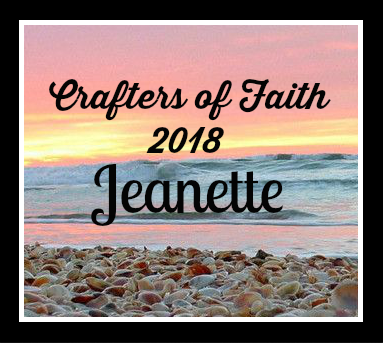 Every Sunday there is a Crafty Ho Challenge! 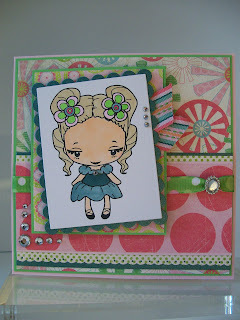 The Crafty Ho's would love for you to create a card/project and join the fun! This week's challenge is an Inspiration challenge. 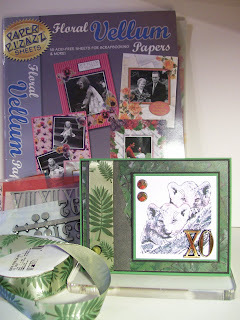 Go to the Crafty Ho Challenge Blog to view the inspiring photo so you can play along! 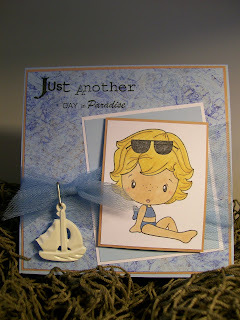 Here's my card - Just Another Day in Paradise! I will admit, I kind of struggled with this challenge. I thought about that inspiration picture for a few days and was getting nowhere. Then I just happened to receive a package in the mail (yep, I've been online shopping again) and it had the CC Designs Bikini stamp in it. By George, I think I've got it! (tee hee) My card went together quite easily after that. 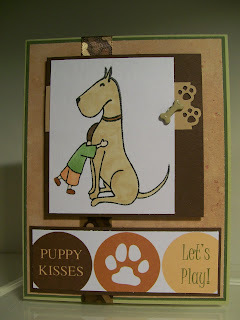 To make the "designer paper" in the background, I took a piece of Stampin' UP! 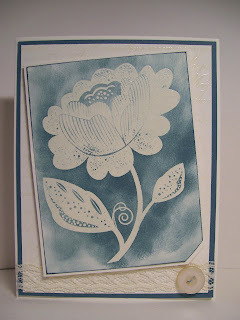 Bashful Blue card stock, some crumpled plastic wrapping from some stamping supplies, and three ink pads. First I inked with Bashful Blue, then with Brilliant Blue, and lastly with Close to Cocoa. I love how it turned out! 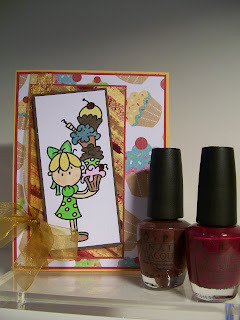 I love the Bugawumps sentiment and couldn't resist adding it to my card. In keeping with the inspiration photo, I used some tulle for embellishment. I also happened to have a white plastic sailboat (it's actually a zipper pull) in my stash of supplies and it was the perfect finishing touch. Each week Squigglefly releases several new images. As a design team member these past six months, I've received many of these images to play with. It has been such fun! I want to thank Holly for sending them my way! THANK YOU, Holly!!! 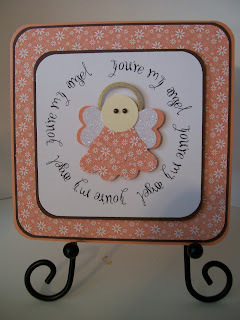 The You Are My Angel image actually has a dainty set of wings and a halo in the center of the circular sentiment. However, I decided to create a punch art angel to put in that spot on my card. The angel was created with the use of three punches - a heart shape (for the body and wings), a 3/4" circle (for the head and the center of the halo), and a 7/8" circle (for the outside of the halo). 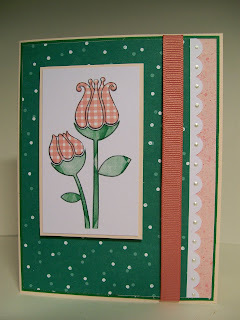 I am entering this card in Aly's Flower Power Challenge. 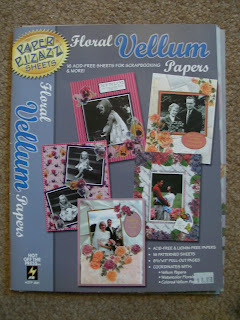 The designer paper I used is covered with flowers, so it certainly fits. 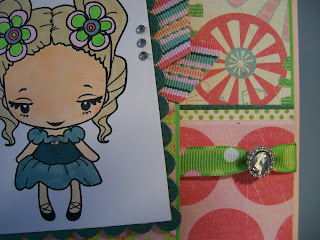 The Sew Many Challenges Theme this week is ANYTHING GOES! I tried to create a pool scene with the use of some wave designer paper. 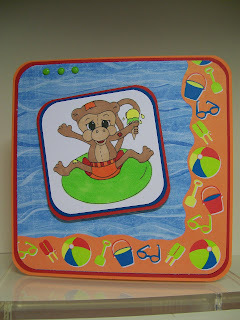 Miki is cooling off while floating around on his inner tube! 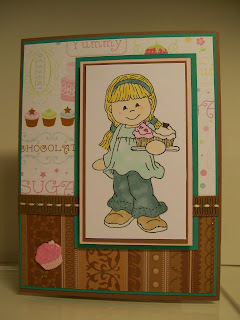 I also had the joy of creating a card with a Stitchy Stamps image. Stitch provided me with the What's Cooking image. (THANK YOU, STITCH! YOU ARE AN AWESOME SPONSOR!!!) It was so much fun to color the What's Cooking image. 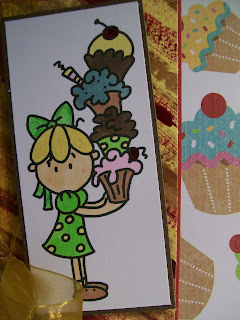 I used some delicious designer papers for a yummy card! 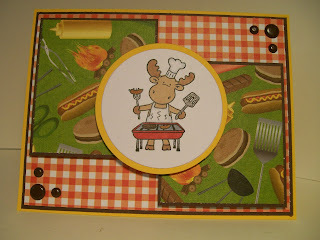 I did some layering to give the card some dimension. 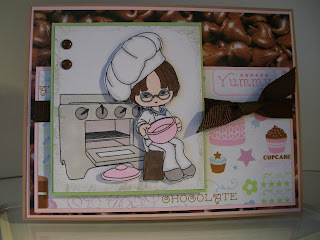 Image: Stitchy Stamps What's Cooking? 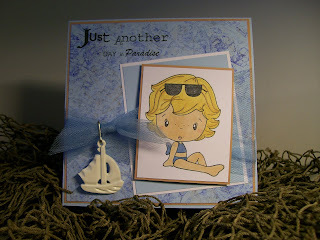 Treasure Hunt and Some Exciting News! This past week's treasure hunt was quite fruitful! hmmmmmmmm... wonder what I can make with all these cool items?!?!?! BTW, my total cost was 55 cents! This is where the EXCITING NEWS comes in!!! Woo Hoo!!! 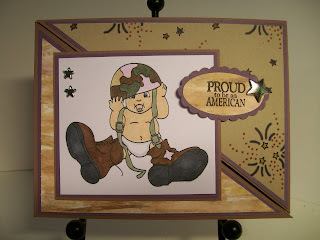 I've been asked to be part of the design team for Stamp 'n Doodle!!! I'm so excited! 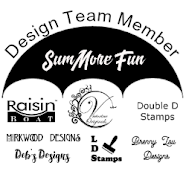 I was not familiar with this stamp company, but oh my... was I thrilled when I looked at the Stamp 'n Doodle store. There are so many beautiful images - many of them very realistic looking images like this wildlife image of two cute little lion cubs named You Calling Us Momma. If you look closely at my card, you'll see that my printer malfunctioned. The image, which is supposed to be black/white, has a streak of pinkish/purple ink running through it. This is NOT a problem with the image, but rather with my printer. I was going to reprint it, but then reconsidered. 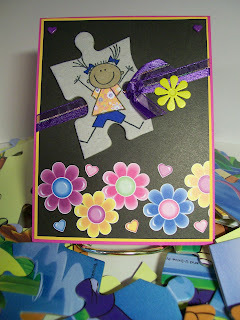 I thought it added to the artsy look of my Treasure Hunt card. I have a special card for you today. It is a reflection of me. (tee hee!) 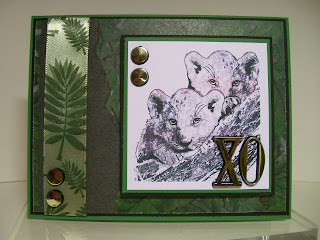 My Splitcoast Stampers name is Forest Ranger. My avatar there is a picture of Smokey the Bear. Dog-gone It... I woof you! 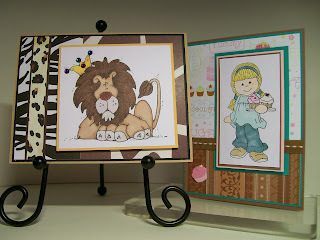 Here are two different cards I made with the card kit I received from Tracey. 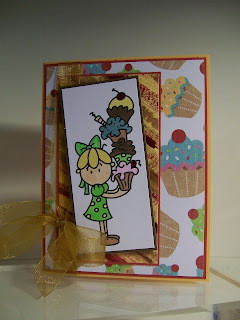 Tracey is the hostess this month in an on-going card swap I'm part of. 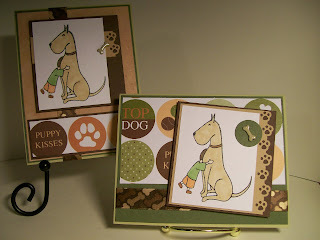 She sent us kits that included images (MFT Furever Friends), designer paper, and some white eyelets (which I ended up not using for these cards). 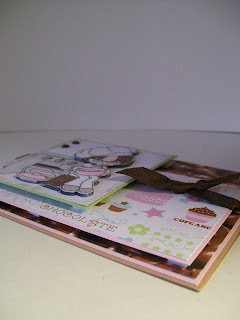 Here's a close-up of the sample card I made with the kit. It's okay, but I wasn't very happy with it, so I re-thought my plan. This is what I finally decided to create. Theme: Add yellow to your creation (in celebration of summer sunshine). What's Cooking on the Grill? I don't like GLITTER! It is soooooooooooo messy!!! That being said, my very good friend, Sweet P, is hosting a Glittery & Glamorous Swap. (cuz I like Sweet P). but I kind of like my card! The background paper is black GLITTER paper. 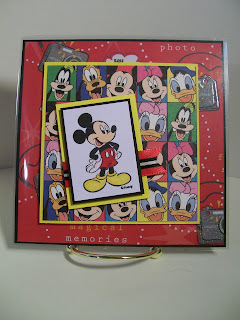 The train image and sentiment are embossed with a GLITTER-ful Embossing Powder. The stripe was created with a piece of sticky strip and red GLITTER. hmmmmmmmmmmmm... I still don't like working with glitter, but I like the results! 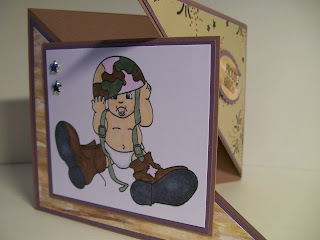 The sentiment is attached simply with a star-shaped brad with allows it to swivel, making it possible to open the card. 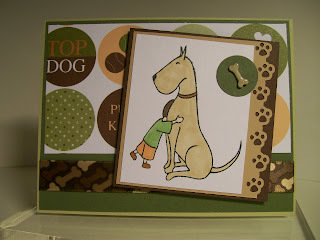 I also had the joy of creating a card using a McMahon Five Designs image, gifted to me by the incredible owner! THANK YOU, SUE! 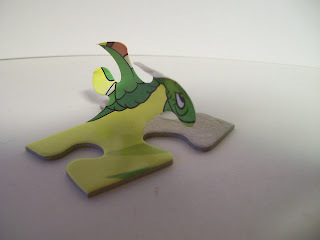 I wanted a blank puzzle piece for my creation, so I simply peeled the slick picture image off of the chipboard puzzle piece. Now, before you look at my card creation, let me ask you... have you ever had a card that looked better in your head than it did when you created it? Wellllllllllllllllllll... this is one of those times for me. LOL! 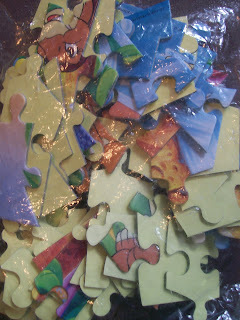 Here's a close-up of the image/puzzle piece. I paper pieced the image, except for coloring the little girl's face with a Copic marker. 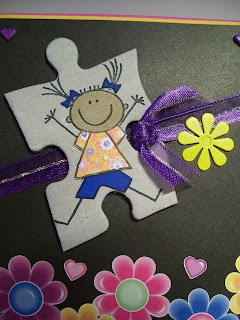 Treasure Hunts + a Dose of Creativity = Fun! Oh my! Is this Victorian??? I am Victorian-challenged. LOL! I need input... puh-leaze! But the question remains... is it Victorian? With Father’s Day quickly approaching, I’ve noticed that many bloggers are showcasing their masculine creations, honoring the men in their lives. 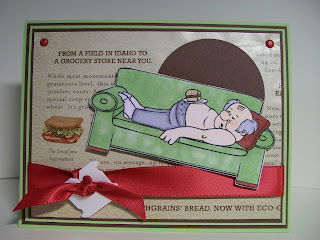 I decided it was time for me to head to my Hideout and create a special card for my own dad… the true Mr. Fix It! Before I go further, let me say, you have my complete permission to read no further! This blog post will be long, because there are so many things I’d like to say about my dad. If you choose to read further, thank you! My parents had two daughters; no sons. I am the younger of the two, Daddy’s little girl. I always adored my dad, in the wide-eyed wonder that only a girl can have for her daddy. He was (and is) my dad, yes, but also my rock and my hero! I remember when I was in second grade. I truly believed my dad could fix anything. One day at school, in my childlike innocence I voiced that thought on the playground during recess. One of my peers mocked me and suggested I was wrong. With my adoration of my dad and the need to defend his honor among my peers, I declared that I was right. Later, when we returned to the classroom, my peer took a Kleenex from the box, tore it in half and handed it to me with the hurtful words, “Here! Have your dad fix that.” I was crushed… for just a moment. Then I remembered all the things my dad could fix and decided this mere peer was “dumber than dumb.” My dad remained Mr. Fix It in my mind! A few years later (and several moves later – did I mention we moved a lot when I was growing up? We moved every 3-6 months, so by this time I’d long left behind that dumber than dumb peer. Yay! )… but I digress! A few years later, my dad finally decided I could learn to drive a motorcycle. Yes, we had motorcycles. The first one my dad bought was a Triumph that he brought home in a trash can. The previous owner had torn it apart piece by piece and was going to fix it but he couldn’t remember how to put it back together. (I don’t know… maybe the previous owner was Dumber than Dumb’s dad???) My dad, Mr. Fix It, was able to put it back together!!! Anyway, my dad spent hours teaching me to drive our little white Honda 150 motorcycle. I was 10 or 11 years old at the time. I loved that bike. A short time later we moved and my new driving area was rolling hills in the field behind our house. I’d take the little white Honda out on the hills, but I was afraid to shift down and it would die part way up the hill. I’d honk my horn, and my dad would come to my rescue! Mr. Fix It would jump on another motorcycle and come flying over the hills to my side. My hero! Less than two months after graduating from High School, I married my High School sweetheart, squelching my dad’s dreams for me to attain a college education. But he never voiced criticism or dissatisfaction. His love was (and is) unconditional. Three years later, my husband became ill. The prognosis was not good. He had leukemia and was dying. During the eleven months that the illness raged, my dad was a source of strength to me. He did so much to help! Perhaps the best thing he gave me was his presence. Sometimes I would see the hurt in his eyes, but mostly I saw his love. And I leaned on him and his strength. After my husband died, I sought solace in my parents’ home. I suppose I was hoping that my dad could fix my heartache, my pain. But in fairness to him, this was something he could not fix… not because my second-grade peer was right, but because only time and the merciful love of my heavenly Father could heal my broken heart. My dad is in his later seventies now. I am so thankful that he has good health. And he’s still fixing things. A few years ago he restored the 1953 (I think) GMC pickup truck that was my great-grandfather’s vehicle. It sure is pretty. My parents take it to Antique Car Shows and it has earned many trophies! My dad is currently restoring an old Corvair Convertible (1961, maybe???) that was my sister’s first car. Some days he gets frustrated with the process, but we are all so proud of his progress. He’s doing well and before long that Corvair will be earning some trophies of its own. But in my mind, the real trophy goes to Mr. Fix It. Remember, he’s my dad, my rock, my Hero! Happy Father’s Day, Daddy! I love you!!! A Snack and a Nap! 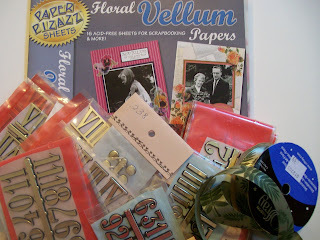 Use Newsprint As a Designer Paper! In keeping with the sandwich/bread theme going on, I used an actual plastic bread-wrapper closure for an embellishment. 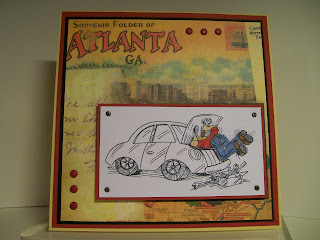 The Squigglefly design team has created some awesome cards using newsprint as a designer paper. You can, too! I'll be watching to see what ideas you come up with! 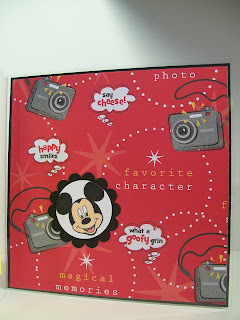 Nothing says summer like DISNEY... and this card definitely qualifies for BRIGHT! 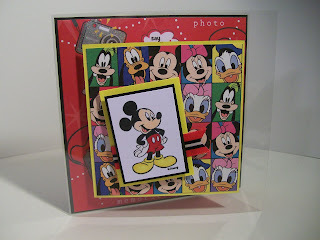 The card base is clear - a piece of overhead transparency, folded to make a card. 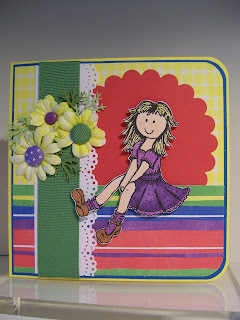 I'd love to see your Summer Brights card, too! Lions and Cupcakes - What a Combination?!?!?!? I just HAD to join her "assorted stamp companies" swap because one of the companies listed was Whipper Snapper... and you KNOW how much I love Whipper Snapper. Then someone suggested she add another company - Bildmalarna. I'd never heard of Bildmalarna, so of course I just HAD to go take a look. Yep, you guessed it! 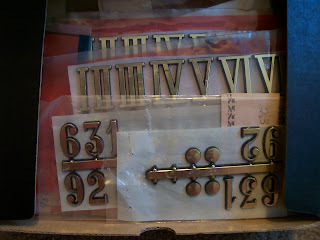 I'm now the proud owner of not one, but TWO, Bildmalarna stamps. 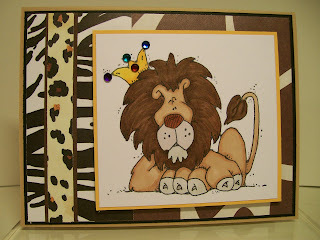 A Fun Lion... Hear me Roar! A Yummy Cupcake... or Two!